Selenite, fluoresces a medium creamy green under both long and short wave ultraviolet light. The fluorescence and strong phosphorescence of this mineral are similar to Travertine Calcite, Fluorite or Strontianite from Ohio. 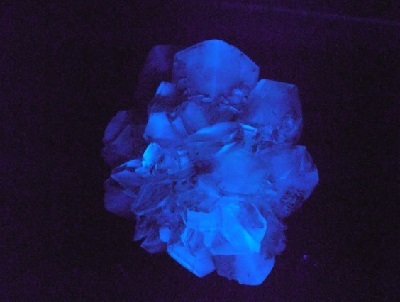 This fluorescence is believed to be caused by slight amounts of petroleum in the crystal structure. The classic fluorescence seen in most crystals from the locality is similar to an hourglass shape. Some fluorescent references consider this an X-ray pattern or X-ray UV phantom. However, due to the amount of sediment which is commonly found in these crystals, the X-ray pattern is often somewhat distorted or milky. Also, the fluorescent portion of the crystal curves under the macrodome face (e). This gives the hourglass shape a more curved or circular appearance. In fact, the brightest fluorescent portion of the crystal is generally found just beneath the macrodome face. On crystals without the macrodome face, the fluorescent portion of the crystal still behaves in this manner. The picture to the right displays an Ellsworth Selenite crystal without a macrodome face. Notice how the fluorescent portion curves away from the crystal’s termination as if a macrodome were present. Although it is far more pronounced in sharper Selenite crystals, this fluorescence has been observed in all crystals from this locality. As is true for most petroleum activated minerals, the fluorescence is strongest under short wave ultra-violet light. Small groups of Selenite crystals can also be found at the Ellsworth locality. 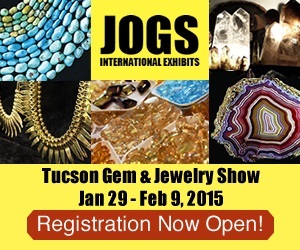 These typically occur when two or more crystals develop in close approximation and eventually form a group. 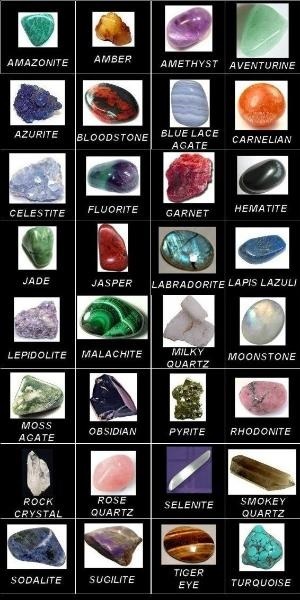 However, due to the fact that crystals are generally small, less than 2 cm, and not abundant in the clay, groups of crystals are not common. 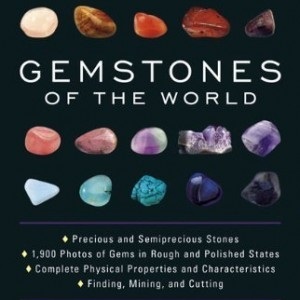 Because the crystals developed as individuals and were later joined, the size, proportion and overall form of grouped crystals are typically unrelated. Crystals of equal size, proportion or form may be joined in a group, but the similarities are coincidental. The photo to the left displays a typical crystal group. The smaller crystal is not large enough to penetrate through the reverse side of the larger crystal. The Selenite group pictured to the right consists of two similar sized crystals which do not intersect at either crystals center of growth. A careful eye will also observe a third, smaller crystal projecting out of the intersection of the two larger crystals. Although the Ellsworth locality is most famous for producing well formed single Selenite crystals, it also yields a variety of twinned crystals. In general, Gypsum is best known for producing contact twins, such as a “fishtail” twin. This type of twin occurs when the two halves of a twinned crystal are united by a twinning plane. The resultant crystal forms a V-shape. While this type of twin is commonly seen at several world-wide localities, it has not been observed at the Ellsworth locality. Crystals from this locality are more inclined to develop penetration twins. A penetration twin occurs when the two halves of a twinned crystal intersect at a common center. Generally, this is also the center of growth for both halves. Typically, these twinned crystals will be of similar size, proportion and overall form. Crystals which intersect at any other point, or are of unequal size are not considered to be twinned. The figure to the right displays seven of the more common penetration twins which occur at the Ellsworth locality. These forms can be separated into two distinct categories of penetration twins. Crystals A, B, C and D in the illustration are classified as “Crossing” twins. The last three crystals in the illustration, E,F and G, are categorized as Butterfly twins. It is important to note, that twinned crystals from this locality are rarely of perfect proportion. 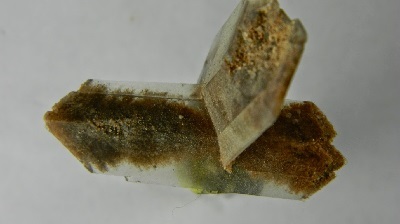 Also, it is not unusual for twinned crystals from this locality to show more than one twinning form. The first category of twinned crystals, “Crossing” twins, encompasses all penetrating twins where the basic Selenite crystal shape is maintained by both crystals. For example, if one half of the twinned crystal were removed from the crystal in the photo to the upper left, the remaining twin would resemble any other Selenite crystal from the locality. This can not be said for butterfly twins. When discussing the different habits of crossing twins, it is first important to understand the difference between a pinwheel twin and a symmetrical twin. This can be clearly observed in Figure IV. above. A pinwheel twin occurs when both halves of the twinned crystal are facing the same direction, as in example A. In contrast, a symmetrical twin occurs when the two halves of the twinned crystal are reversed, as in example B. The latter of these two crystals forms a clear symmetrical X shape. A true pinwheel twin is never symmetrical. Parallel twins occur when the two halves of a twinned crystal have developed in parallel planes. In General, crossing parallel twins are usually slightly offset. The photo to the lower right exhibits a classic parallel pinwheel twin. Notice that this crystal is in no way symmetrical. Also, although the two halves of this twinned crystal developed in parallel planes, one of the twinned halves appears to be in front of the other. Rarely, pinwheel twins of this type will also develop in the same plane. This is not true for symmetrical twins. If the two halves of a symmetrical penetrating twin occur in the same plane, a butterfly twin is always developed. For instance, in the figure above, crystal B is similar to crystal F. However, crystal B is offset and crystal F is planar. The photo to the lower left is an example of a symmetrical crossing twin. These are rarely encountered due to the fact that a butterfly twin is often formed even if the two halves of the twinned crystal are slightly offset. One of the more interesting crossing twinned crystals to be recovered from the locality is the intergrown cross. This type of twin occurs when the two halves of the twinned crystal share a common center, but are not parallel to one another. Intergrown crossing twins may be pinwheel shaped or symmetrical, as pictured to the upper left. The basic Selenite crystal form is more clearly identifiable in intergrown twins than in any other twinning habit.